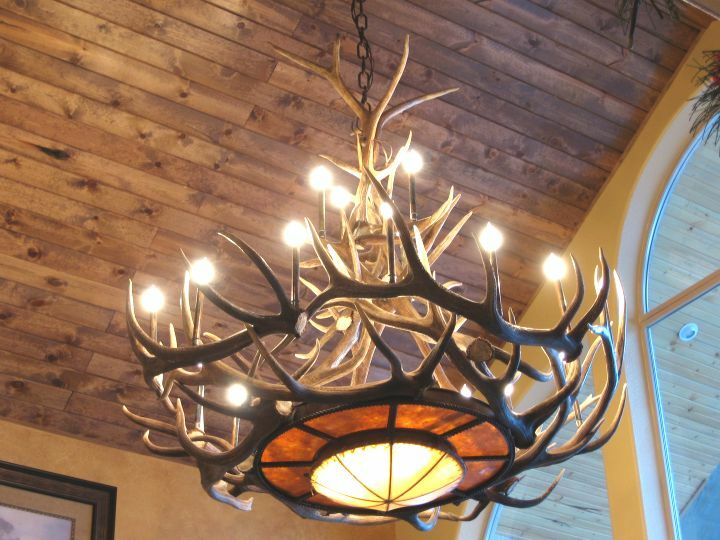 Antler Chandeliers, Lamps and Lighting made in Colorado of Natural Real Mule Deer, Fallow Deer, Whitetail White Tail Deer, Elk and Moose antlers. ail White Tail Deer, Elk and Moose antlers. 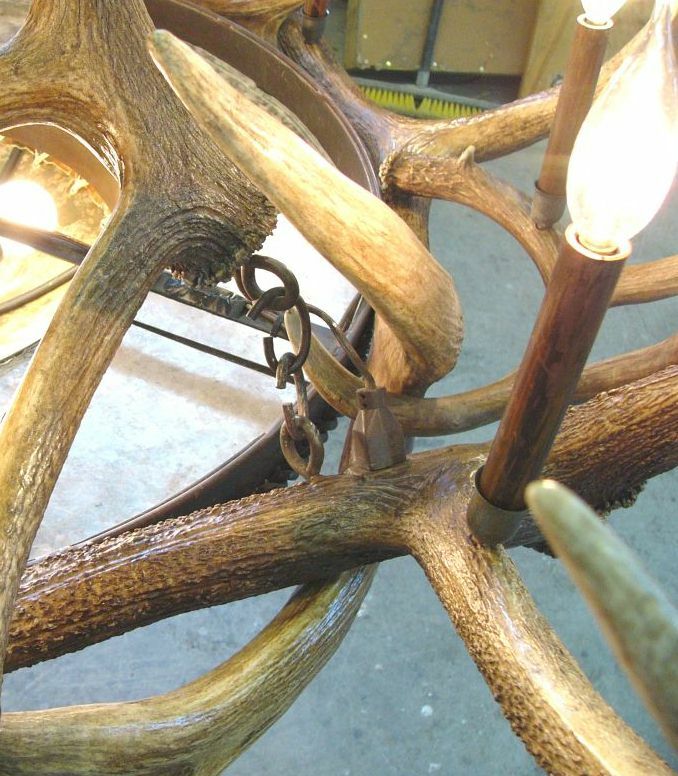 Our Mule Deer table lamps are made of 3, REAL Mule Deer antlers. Not the cheaply made, Chinese cast resin versions you commonly see. These are real antlers, that are shed normally, every year, throughout the course of a deer, elk or moose life. Fixtures are constructed so that the wiring is hidden inside the antler and entire unit is UL listed for safety. Each table lamp comes with 8 inch harp and antler finial. They are available with the shade shown in each version, or without for you to customize yourself. Each lamp is custom made and takes from 1-2 weeks to construct once ordered. 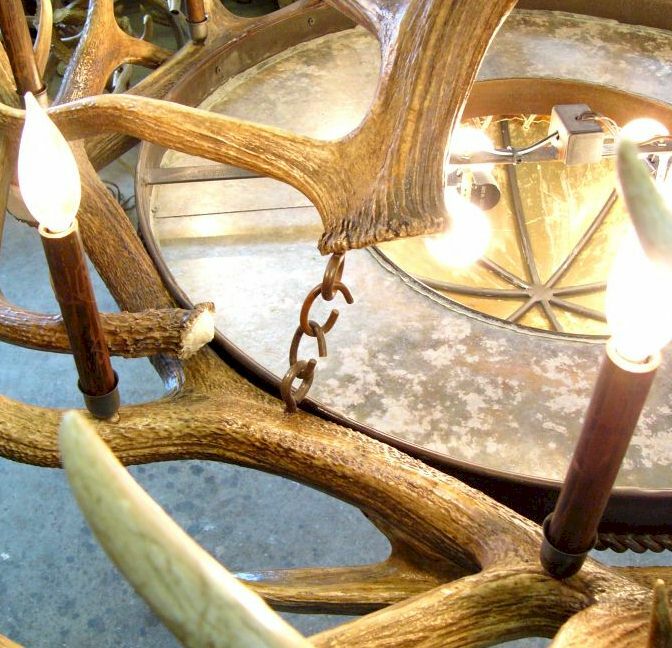 Due to the unique character of real antlers, each lamp varies from 26" to 28" in overall height. The shades are of premium quality, and rarely available elsewhere. Yes, these lamps are expensive when compared to the cheap, Asian made, resin version, but if you like "The Real McCoy", made at the foot of Pikes Peak, in the Colorado Rocky Mountains, and that are purchased directly from the craftsmen who have been making them for years, then here you go. 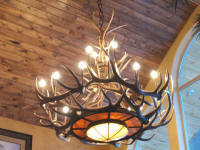 Our antler Chandeliers are made of REAL Mule Deer, Moose and Elk antlers. Not cheap, Chinese cast resin. These are real antlers, that are shed normally, every year, throughout the course of a deer, elk or moose life. 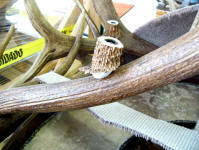 Fixtures are constructed so that the wiring is hidden inside the antler and entire unit is UL listed for safety. 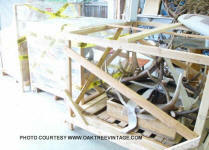 Each fixture is custom made and takes from 1-12 weeks to construct once ordered. Due to the unique character of real antlers they will vary slightly in dimensions. Yes, these antler fixtures are expensive when compared to the cheap, Asian made, resin version, but if you like "The Real McCoy", made at the foot of Pikes Peak, in the Colorado Rocky Mountains, and that are purchased from the craftsmen who have been making them for years, then here you go. #550 The Big Tweed. It's big! This model originally started as a custom made fixture for one client, but became so popular with so many requests that it was added to the permanent line-up. Beautiful amber glow from the mica and the heavy rawhide dome base. Large 6 point Elk antlers circle the center, with tall patina coated copper sleeves for the 21candles. 21 up lights & 4 down lights, 60 watts per light max, 1500 total wattage possible. UL listed for safety when "hardwired" by a qualified electrician into standard wall wiring box. 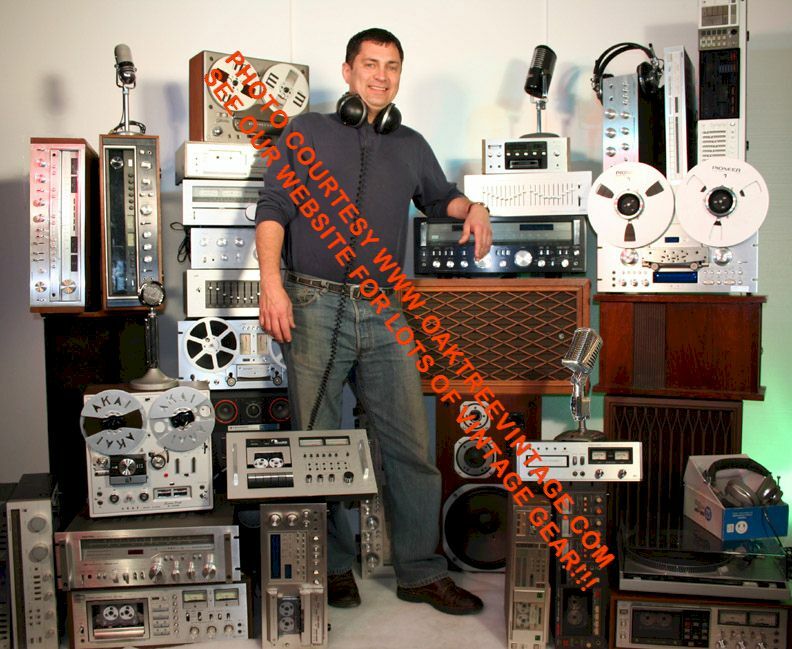 As this is a larger unit, capable of a maximum of 1500 watts, it is wired with 2 feed lines. These can be combined by your electrician or used to control the fixture in 2 halves separately. Can also be wired with simple AC cord / plug, with or without switch if UL listing is not required or AC box is unavailable. This piece is impressive and elegant. While each antler chandelier creation is unique, they typically measure ~78" wide x 78" in height (that's over 6 feet) and weighs ~180 lbs unpacked. As another size reference the diameter of the rawhide light dome is 20" and the mica medallion is 34". Antler Cup socket close-up. Lamps can generally be mounted in antler cup sockets or antiqued patina copper "candle stick" sockets. Optional 2nd tier coupling, used when structure openings are less than the smallest dimension of the lighting fixture. SOLD fixtures awaiting final packing / truck pick-up.